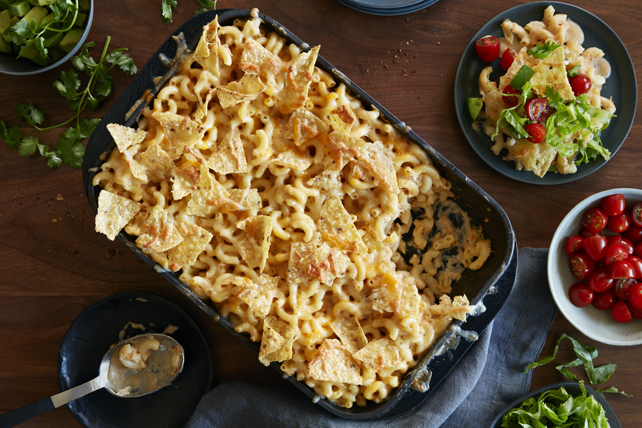 Whether you're in the mood for nachos or mac and cheese, you're sure to be satisfied with this delicious casserole. The creamy mac and cheese gets its flavour boost from colourful nacho toppings in this fun take on a time-honoured classic. Meanwhile, whisk milk, flour, taco seasoning mix and Worcestershire sauce in medium saucepan until blended; cook on medium heat 5 min. or until thickened, stirring constantly. Add 1-1/2 cups cheese; cook and stir 2 to 3 min. or until melted. Drain macaroni. Add to cheese sauce; stir until evenly coated. Spoon into 2-L casserole dish sprayed with cooking spray; top with remaining cheese and crushed chips. Bake 20 min. or until heated through. Serve topped with tomatoes, lettuce, avocados and cilantro. For convenience, the casserole ingredients can be mixed together ahead of time. Just do not top with remaining cheese and crushed chips as directed. Refrigerate up to 24 hours. About 40 min. before serving, heat oven to 400ºF. Top casserole with remaining cheese and crushed chips. Bake 30 min. or until heated through. Serve topped with tomatoes, lettuce, avocados and cilantro.